I first saw this posted on Reddit about a year ago. 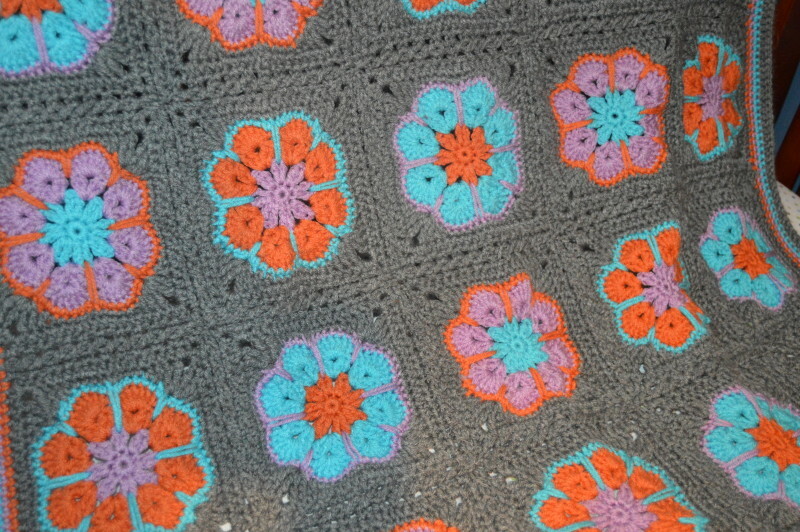 I knew right away that if I had a reason to make a blanket for a baby girl, this afghan was going to happen. And it did. This is the perfect addition to Maggie’s blanket collection. 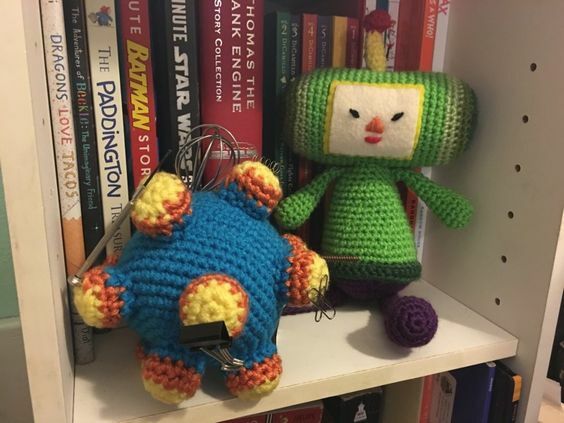 This was posted to r/crochet by user cgsf. I absolutely love her choice of colors and basically copied it as close as I could. Something about the aqua, orange and purple speaks to me. It isn’t super girly, but the flowers keep it feminine. And it goes perfectly in our nursery. Our house only has 2 bedrooms, so Maggie will be sharing Liam’s room. 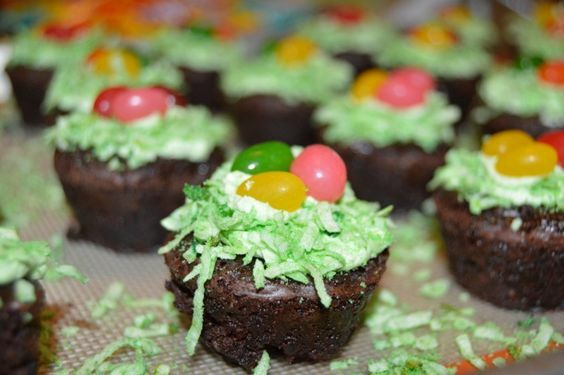 It was already decorated in teal, orange and green. This just adds a bit of purple and fits right in. 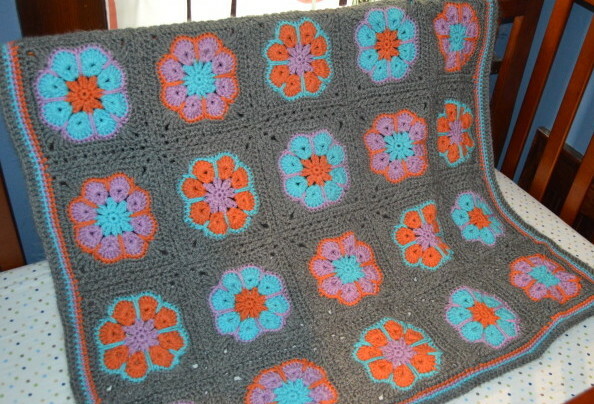 The pattern is actually a free pattern from Ravelry called African Flower with 8 petals. 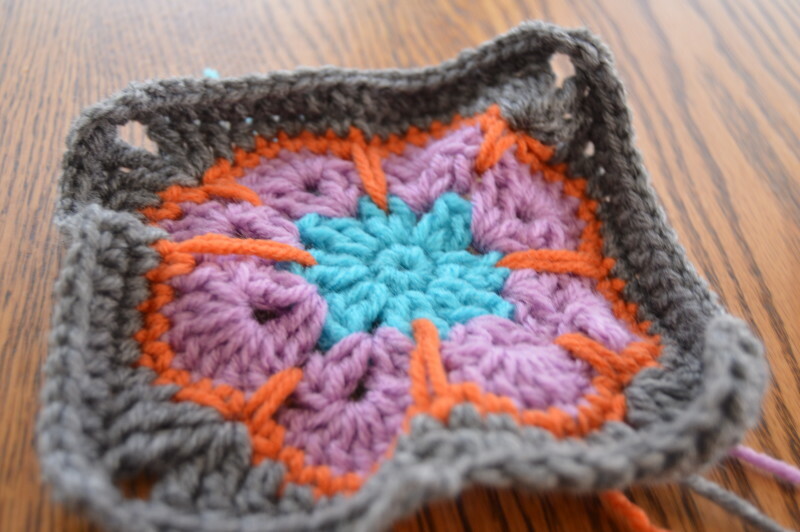 The pattern is broken into two parts, one to make the flower and another to turn it into a square. The pattern called for DK weight yarn and a 3 mm hook. I didn’t want to make hundreds of squares, nor did I want to buy special yarn, since everything else I do is worsted. So I just used Red Heart Super Saver and a I hook. My squares are about 5 inches and my finished blanket is 5 squares by 5 squares, once you add in space for the join and a boarder, it is about 32 inches square. Like I mentioned, I used Red Heart Super Saver yarn. The colors are Grey Heather, Turquoise, Orchid, and the orange is actually Red Heart With Love in Mango. I needed less than one skein of each color, except the grey, which was a smaller ball so I used 2. I’ve said before that Super Saver is not my favorite yarn, but it is growing on me. Once you wash it, it does soften up quite a bit, and it is easy to find just about any color you can think of, and it is inexpensive. The squares work up pretty easy, but mine were a bit wavy. 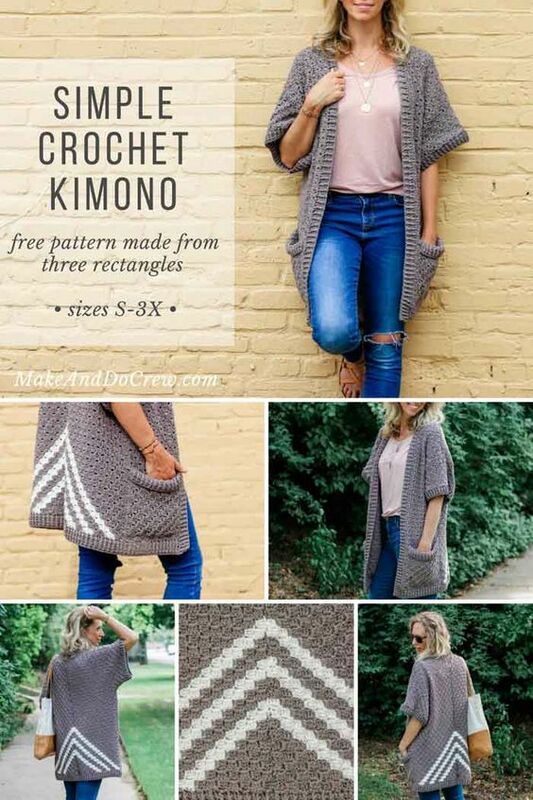 I decided to block them before I joined them, thinking that would make the joining easier, if the square were flat instead of curling up every which way. To block them, I just got them damp in the sink, wrung them out really well, and pinned them to an old cork board I had. This worked fine, but my cork board never dried properly and had to be tossed. Oh well. 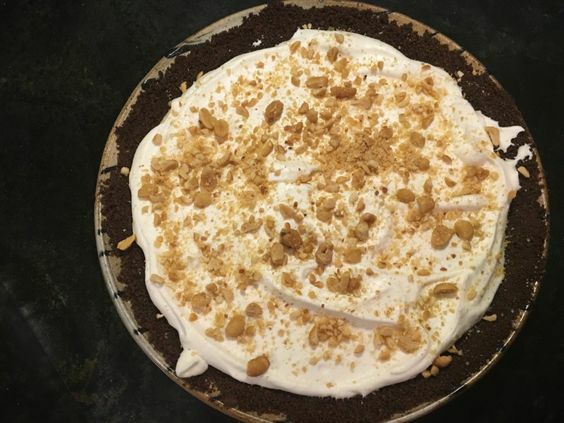 Afterwards, the squares were nice and flat and easy to join. I was a bit afraid that once I washed the blanket, all the wavy wonkiness would come back, but it didn’t. 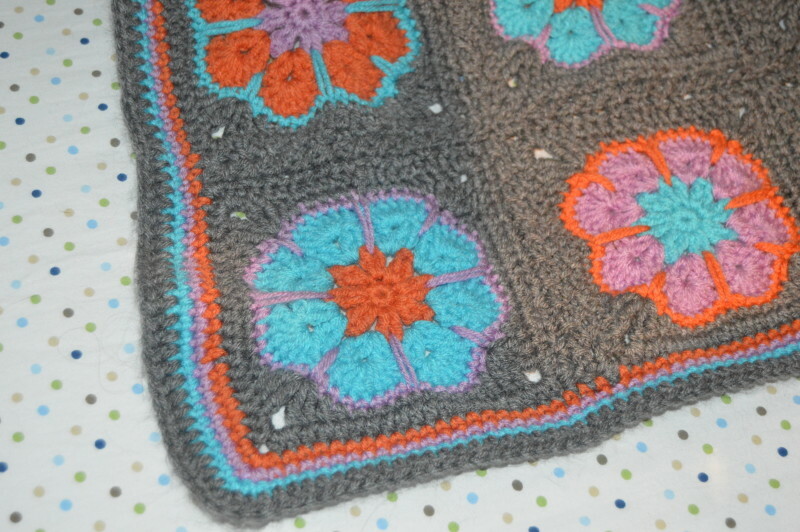 The blanket has a bit of texture, but nothing like the unblocked squares had. 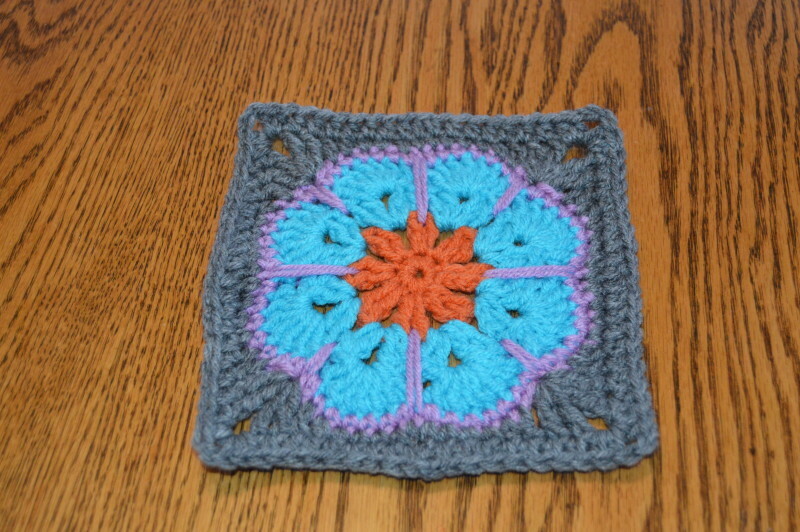 To join the squares, I took cgsf’s lead and used a flat braid join. There are tutorials all over the internet, but this is the one I found most clear. I like the twisty braided look it gives and it isn’t difficult, just a bit time consuming to do. I didn’t do the joining round all the way around all the squares as I didn’t want to have that round on the outside of the blanket. This just meant I had to plan ahead a little so that I only went around 3 sides of the edge pieces and two sides of the corner pieces as I joined. 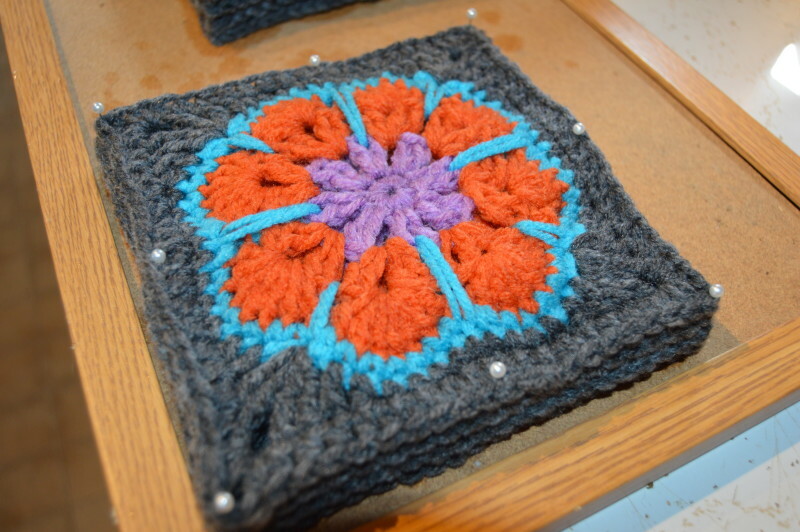 For the border, I did a round of sc in each of the accent colors, then a round of double crochet in grey. 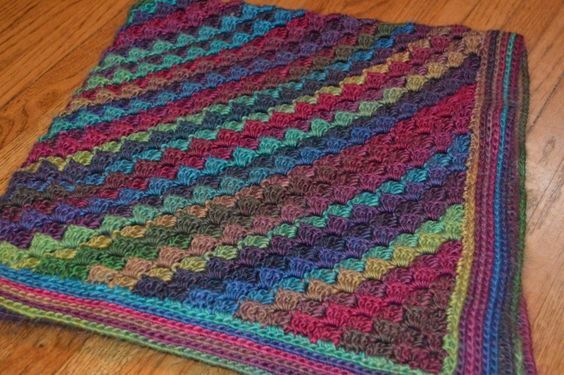 The blanket I was coping used a reverse single crochet border, which I loved her her pics, but I couldn’t get it to look right when I tried it myself. 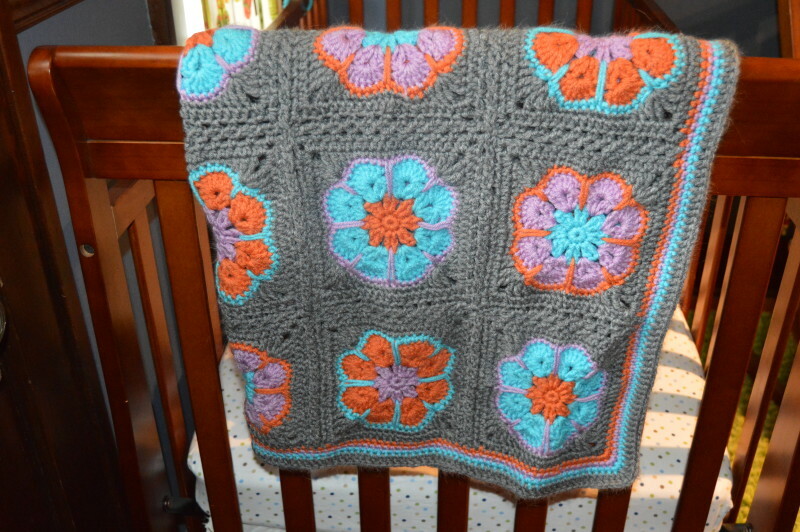 So there you have it, the African Flower Baby Blanket. I hope Maggie likes it when she makes her arrival sometime in the next two weeks.